Michael Ball is a musical theater performer very popular in his native England. He parlayed this into a recording career when Love Changes Everything from Aspects Of Love was a top five hit in England in 1989. It is his signature song. He did appear in the Broadway production of Aspects Of Love but he is unknown outside England. He was born June 27, 1962 in Bromsgrove, England but he grew up in Dartmoor. He was a big Ella Fitzgerald and Frank Sinatra fan. And his parents took him to live theater. Ball studied drama at Guildford School of Acting. His big break came when producer Cameron Mackintosh cast him as Marius in the 1985 production of Les Miserables. Then he replaced Michael Crawford in Phantom of the Opera. And then he was cast as Alex in Aspects of Love in 1988. All three shows were produced by Mackintosh. Ball also appeared in the Broadway production of Aspects Of Love. Ball had planned to stick to live theater. But Love Changes Everything from the Aspects of Love original cast album was released as a single. A video was shot. The song reached #2 on the British Singles chart in 1989. That got Ball a record deal at Polydor. His 1992 debut album Michael Ball was produced by veteran Polydor house producer Mike Smith though Aspects of Love composer Andrew Lloyd Webber produced Love Changes Everything. To date this is Ball's only big hit though his albums sell very well. This budget comp is a good intro to his music. Ball continues to record and tour. His most recent albums were recorded with Les Miserables star Alfie Boe and they are on tour in England. He also appears on TV a lot. He hosted his own variety show in 2010. Ball last appeared on the London stage in 2012. I'm sure he will return when the time is right. 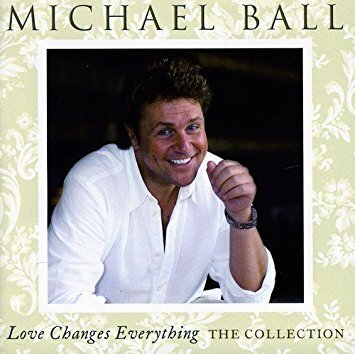 Here's the video for Love Changes Everything by Michael Ball.